Tag Archives: how did Disney get oswald back? This, my friends, is what happens when you auto-post! For those of you experiencing deja vu, I had two versions of this post written, one I auto-posted in July when I was back in Vermont at my graduation. And not remembering that I had done that, I posted this one today. Raise your hand if you know who Oswald the Lucky Rabbit is? Yep, those are my Disney fans! Before Mickey Mouse, there was Oswald the Lucky Rabbit. Oswald is kind of a strange-looking rabbit, like what Mickey might look like if he were a rabbit instead of a mouse. And what’s the deal with Oswald? Well once upon a time, Walt Disney was an animator, and he and his partner drew Oswald for Universal Studios. 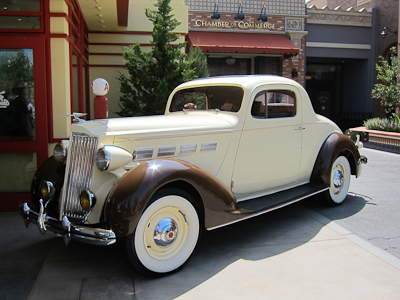 To make a long story short, Walt left Universal, Oswald stayed, Walt and his partner created Mickey Mouse, and Buena Vista Street got Oswald’s Filling Station. Oswald the Lucky Rabbit belonged to Universal for a long, long time, until 2006 when Bob Iger, Disney’s CEO, decided to get Oswald back by trading sportscaster Al Michaels from ABC/ESPN to NBC Universal. I’m not kidding about that. Oswald was traded for a sportscaster. 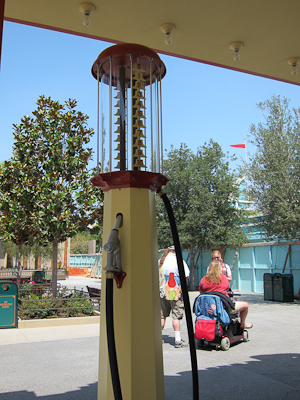 But back on Buena Vista Street, Oswald’s Filling Station is the first building you see on your left. Please ignore the fact that the first picture is at night and the rest are in daylight. What can I say, I have an annoying tendency to photograph every inch of something except for its entrance and sign. So I backfill. Deal. Oswald’s is a small this-and-that kind of store. 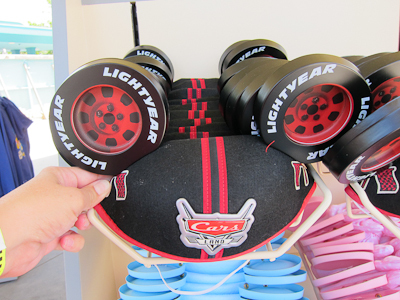 A few mouse ears, some Route 66 swag, etc. And of course, full of great details. 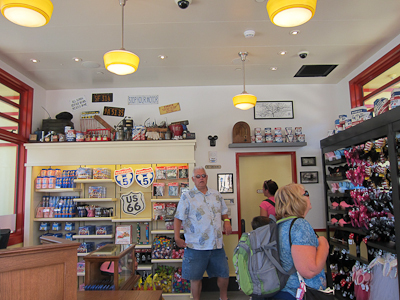 Oswald’s is a great opening store for Buena Vista Street and will put a smile on your face every time you walk past it. Once upon a time there was an animator named Walt Disney. He created a character named Oswald the Lucky Rabbit. Oswald was kind of funky looking–a bit like what would become his younger brother, Mickey Mouse, except with long black ears. 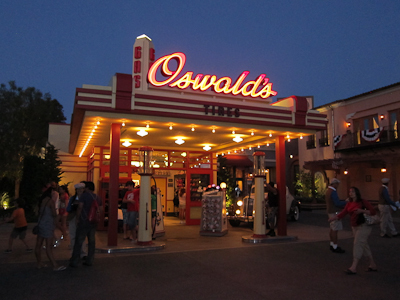 Unfortunately, Universal owned the rights to Oswald, so he hasn’t made any appearances in the Resort…until now! Disney actually ended up trading ABC/ESPN sports caster Al Michaels to NBC, and in exchange Universal signed over their rights to Oswald. Talk about a bizarre switch, but it worked! 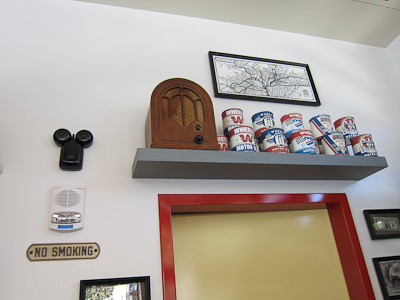 Oswald’s Service Station features gas pumps of the era. 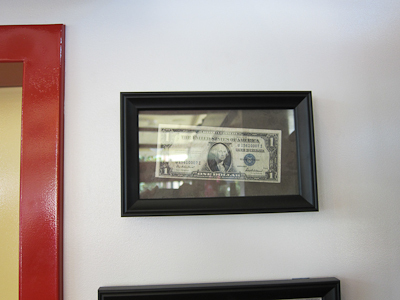 And of course, the loving details that make Disney amazing. And this is my favorite part. Such a fun little store right as you walk in to the park.